We headed out of Melbourne to the Yarra Valley, home to a mere 105 wineries. They range in size from the very large and corporate Yellow Tail, which brought Australian wines to the attention of US drinkers but no one here drinks today, to Mom and pop wineries producing 10,000 cases. Five are under Chinese ownership. China has become a big market for Australian wine, as has the US. Although it was only 10:15 am, we had to stop at an Alcohol Road Block for breathalyzer testing! There were about 8 young policemen and women in a line waiting for us. We wondered why the police would bother with this so early in the day. We know Australians like their wines, but even so…! However, our guide John explained that these must be trainees learning how to administer the test. 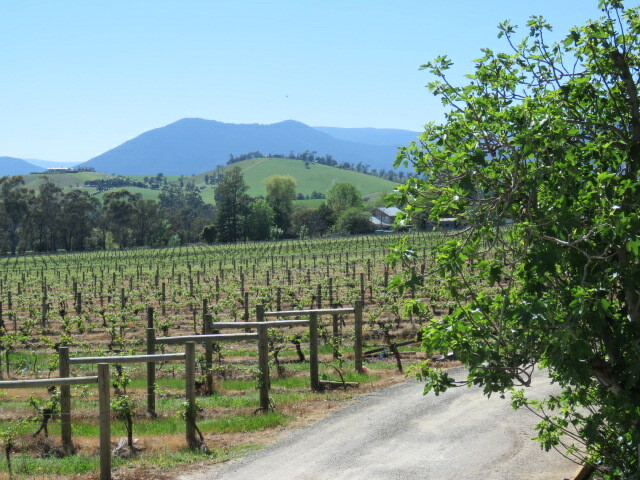 We headed out on the Melba and Maroondah Highways, two of three wine routes in the Yarra Valley. The Valley’s scenery is lovely, with rolling hills and orchards. In addition to vineyards, there are acres of strawberry fields, harvested by Cambodian and Vietnamese immigrant field workers. Some of the wines have especially amusing names, such as Giant Steps and Innocent Bystander. Clever! First we made an unplanned stop at Coombe Winery, once the property of Dame Nellie Melba, the famous opera singer. It’s a lovely estate, with a small display of photos of Dame Nellie and some artifacts, like this vintage Louis Vuitton steamer trunk she used in her travels. While we were there, we thought we may as well do a tasting. The wines were young, 2016 vintage, and hadn’t developed much yet. (In other words, we weren’t impressed…) We did learn that the cooler climate in the Yarra Valley gives its wines a different character to wines compared to those in the Barossa, McClaren, and Clare Valleys, which are known for their big Shiraz. Speaking of Shiraz….It is the one type of wine that Don absolutely doesn’t like. He agreed to try them on this trip, because Shiraz (Australia) and Syrah (New Zealand) are big producers of this wine. As a blending grape, he’s sometimes OK with it, but a Shiraz/Syrah-dominant wine? Forget it! As he said, he’s never met one he’s liked, but was willing to be proven wrong and tried them at every winery. While at Coombe, we visited their art gallery, where Don fell in love with the work of a very creative sculptor, who happened to be there. This quirky piece appealed to him, but we passed. The workmanship was amazing. She explained how she made the piece, using clay, fabrics, and assorted bits and pieces such as bandages for the sleeves and legs. While walking around the vineyards, we were serenaded by this frog chorus….! It’s worth waiting for it to load to hear it. To end our day, what could be better than a visit to the Yarra Valley Chocolaterie and Ice Creamery? We enjoyed excellent gelato before heading back into Melbourne. While we enjoyed our day of wine tasting, we agreed that the wines were good. However, none excited us enough to buy any, even if it had been convenient to do so. So ends the Australia segment of our trip. Off to New Zealand! What, no pictures of food? ?